The clothes will load in their default state. The mats are in the MATERIAL FOLDER. Little note about the Mats: the magic won't happen until the Render. Figured that Ben could use some dressier clothes than he currently has. MAY be used for personal and/or commercial renders. May create textures. - You may NOT sell the original files herein in whole or in part. - You may NOT use or alter them in any way to make your own packages. Nightcool789 (5 years ago) Inappropriate? Bee (5 years ago) Inappropriate? Hi! The shoes ask for file ":Runtime:Python:poserScripts:PhilC:Shoe Designer:textures:lace_up_boot_foot_TEX.jpg"
Nobody (8 years ago) Inappropriate? 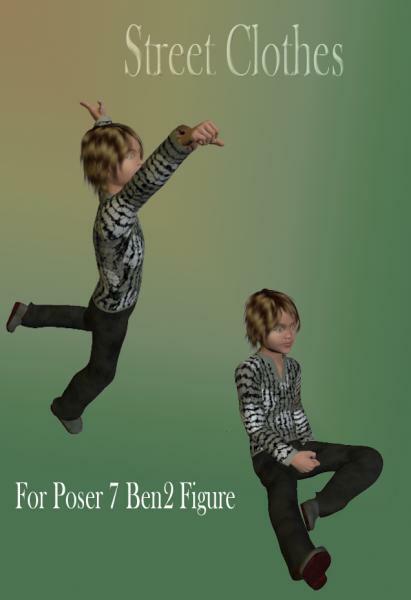 You should really market any clothing you make for Ben as Poser 6 Ben and Poser 7 Ben compatible since they both share the same rigging and UVMaps. You'll see twice the views and people will be happy to find clothes for both versions of Ben work on both figures. Thanks for expanding Both Ben's wardrobes! I went ahead and re-uploaded it again and tested it. Hopefully this will end any issues some have been having. Thank you for this clothing set, but I have the same problem as Nanette. Please reup. Would you please check the file I am unable to unzip it. I have downloaded it several times. Very nice and very welcome, thanks so much.